In 2016, a group of men decided to play music together. The way most bands start, they decided on a name - Dark Sky Choir. An original name for an original hard rock metal band out of New Jersey / New York area. A year later in 2017 Hollywood How and Joe Stabile were replaced with Brian Allen and John Moyer. Each of them bringing their talents to Dark Sky Choir creating a band that is not only making a name for itself, but leaving their mark on the venues they perform in, and music in the ears of their fans with each live show, video, and track they share. On Saturday, Feb. 9, Dark Sky Choir will be performing at the Starland Ballroom in Sayreville New Jersey. Joining them for a night of hard metal greatness is Ascending From The Ashes, Broken Past and Channeling Cornell - The Ultimate Chris Cornell Tribute. Special Guest is Tim Ripper Owens, former Judas Priest frontman will be performing a few songs with Dark Sky Choir. It is a show not to be missed. Dark Sky Choir has decided to give the first 500 people through the doors a copy of their brand new "End Of Days" CD. For tickets and availability please check out the event details here (Tickets). 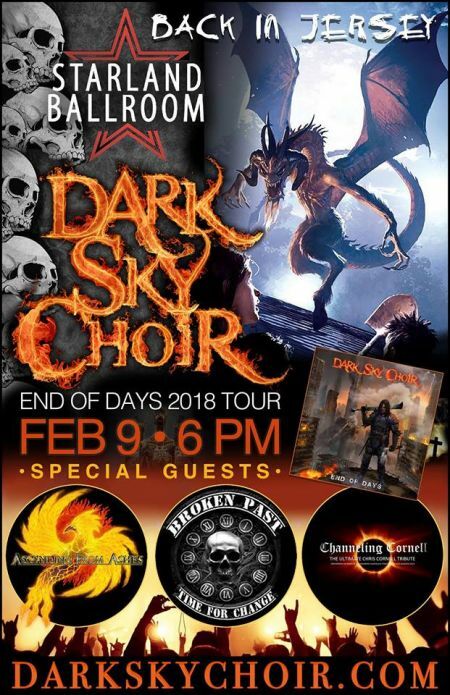 AXS: Dark Sky Choir was formed in 2016 - Does the name have a meaning to the band, how did the founding members agree on the name? Fred Gorhau: Our drummer Mike actually came up with the name. We started out as a metal cover band, and the name sounded cool. I wish I could tell you it has some deep meaning. AXS: At what age did each of you start playing a musical instrument and what was it? Did any of you attend school for formal/classical training? FG: I started when I was about 12. Self-taught initially, but I did take some lessons, including classical, jazz improv and composition. AXS: Each member has an impressive background in music and performing, What has influenced the band's decision to play the hard rock/heavy metal music? FG: That’s the music I grew up with, the music I loved. This band was put together with the idea in mind that we’d play and eventually write music that we were into. It made sense that if we liked something, people with the same taste in music would like it also. AXS: What is the craziest thing that has happened on stage during a performance? FG: Many years ago, in a different band, I flipped my guitar around my back. I had done it hundreds of times, so it wasn’t anything new, but my strap lock failed and my Les Paul crashed into the Marshall Stack behind me. Broke the headstock. Thank god I had a spare. I miss that guitar. AXS: Who is the most memorable performing any one of the band members have shared the stage with? FG: For me, far too many to list. I’ve been lucky to play with many talented musicians, particularly in this band. Coming soon, we will be sharing the stage with Ripper. AXS: Where can the fans listen/purchase your music? AXS: Where can your fans find you online to follow the band's news of tours, new albums, and videos?